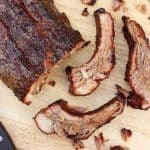 Learn how to smoke meat on a charcoal grill by starting with these impressive Smoked Spare Ribs with a homemade Rib Rub. DISCLOSURE: This article contains affiliate links. 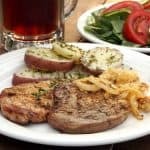 These links are provided to help you find some of the more specialty products we mention in the recipe. If you make any purchase after clicking through one of our links, we receive a small commission, at no extra cost to you. Thank you for supporting Curious Cuisiniere! You can smoke meat in your charcoal grill. “Sure you can. But, it’s got to be super complicated and bothersome.” That’s what we thought when we heard it was possible to smoke in a grill. But, with Tim’s love of smoked meats, and the purchase of a smoker not in our near future, we decided to give it a try with what we had. In addition to your typical grilling tools, you will need wood chips. These pieces of wood will give off the smoke that we’re looking for. 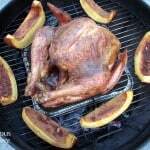 You can use hickory, oak, apple, cherry, or mesquite chips, and each will give a slightly different aroma to the meat. We used apple chips from a tree we cut down last fall, but feel free to play around with different chips to see which flavor your family likes best. In order to create smoke (and not burn outright) the chips need to be soaked in a liquid for an hour or more before the smoking begins. 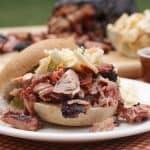 You can soak them simply in water, or you can use beer, wine or apple cider to give additional flavor to the smoke. To turn the charcoal grill into a smoker, you will be using indirect heat. 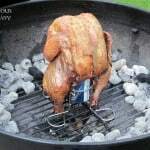 This means that you will need to arrange your hot coals on either side of the grill, so that they are not directly below the meat you are smoking. 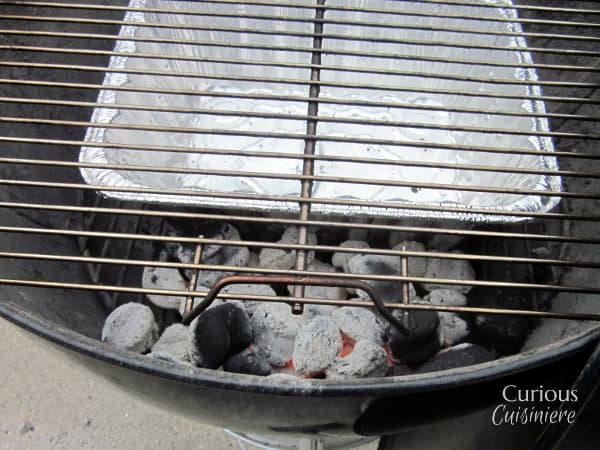 To do this, we placed a disposable aluminum pan on the center of the bottom grate and used it to hold the coals to either side of where we would place the meat. 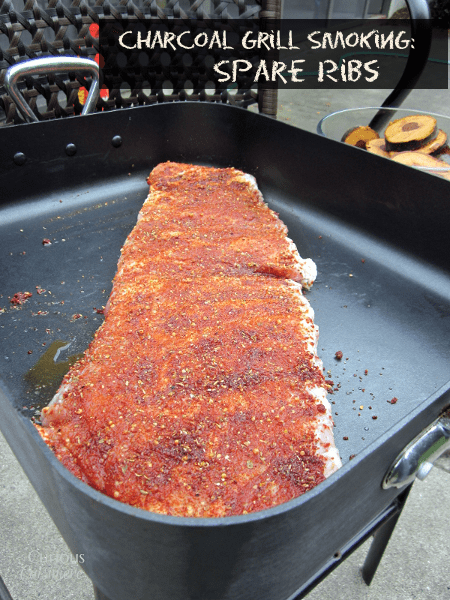 This pan also does double duty as a drip pan during cooking. When you are ready to cook, toss about 3/4 cup of soaked and drained wood chips onto the hot coals on each side of the aluminum pan. You should notice smoke nearly immediately. 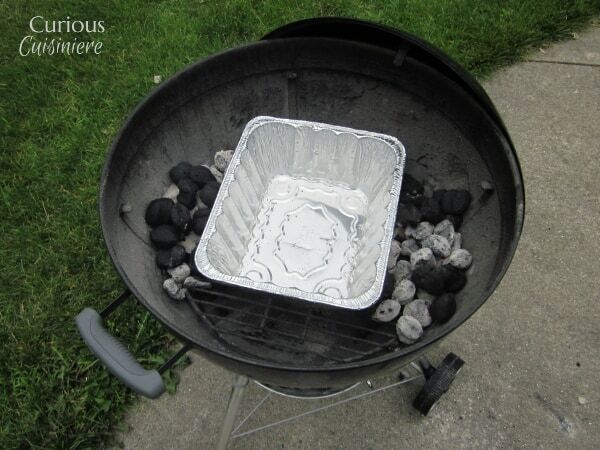 Place your cooking grate on the grill. Close the grill and adjust your vents to get a proper temperature inside. You should be smoking at a low heat. After a few moments, remove the cover of your grill and place your hand about four inches from the cooking grate. For a ‘low’ heat (around 250 – 300F) you should be able to hold your hand over the grate for 8-10 seconds. Of course, a more exact way of measuring the temperature of your grill smoker is with a leave-in probe thermometer. ThermoWorks makes a really cool tool for this in their Smoke 2-Chanel Alarm. It lets you monitor both the temperature of your meat and smoker at the same time, from one easy display. (And, it has a wireless receiver so you can keep an eye on your temps while doing other things.) Definitely an essential to up your smoking game! Smoking takes anywhere from 2-3 hours all the way up to 20 or more. 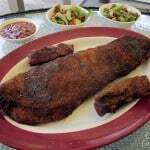 It is this low and slow method that tenderizes the meat and infuses it with incredible flavor. A good smoke can’t be rushed and will be ruined by heat that is too high. Every hour you will need to add a few more coals and about a 1/2 c of soaked and drained wood chips to each side of the pan. This will keep your heat and smoke levels consistent. Checking it every hour also lets you check to be sure the heat level is still where you want it and adjust accordingly. Today we’re grilling spare ribs. They will be a meatier and fattier cut of pork than the tender baby back ribs, which is why spare ribs are known for being incredibly juicy. If you get a cut of ribs labeled “St. Louis Style”, these will be spare ribs that have already been trimmed of the gristly rib tips and the tough membrane. A St Louis style cut has slightly less meat, but they are more of a uniform shape (perfect for even cooking) and all the trimming work has been done for you. What cut you get is up to you. But, for first time rib smoking, starting with a St. Louis Style cut or a well-trimmed spare rib cut with the membrane removed from a trusted butcher will make your job a lot easier. To prepare the ribs for cooking, we first marinated the ribs in apple cider and lemon juice for 2 hours. 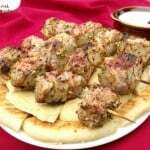 This starts to tenderize the meat and infuse it with flavor. Next, we patted it dry and massaged in a dry rub. See below for our go-to Basic Rib Rub, or try a Mesquite Seasoning Mix to pump up the smoky flavor or, go with another of our favorites, an Asian-inspired rub. We let the rub start to work its flavor magic while Tim got the grill ready with the steps we talked about earlier. Then, onto the hot grill went the slab of meat! Every half hour to hour we sprayed it with apple cider and added more chips and charcoal. One thing we did learn was the importance of keeping the heat LOW. After about the first hour the heat spiked a bit and sped up the cooking. Our ribs were nearly done at about 2 hours, when they should have taken longer. We decided to lower the heat and leave them on for just a bit more, to see what would happen. Unfortunately, the ribs got a bit darker than we were hoping. But, even with the darker color, after 2 1/2 hours we had some incredibly delicious ribs. 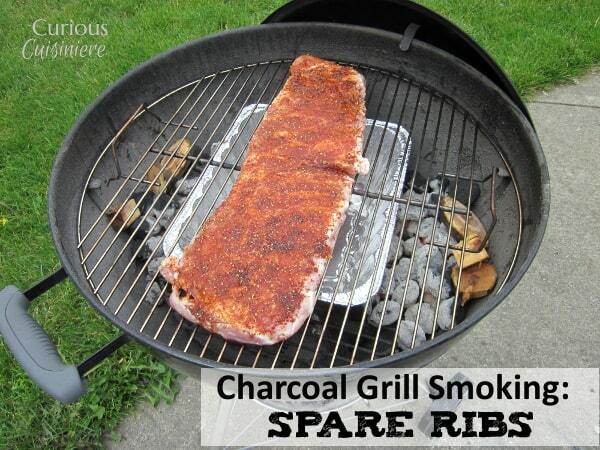 Learn how to smoke meat on a charcoal grill by starting with these impressive Smoked Spare Ribs. Place the meat in a large, shallow, non-reactive container (a roasting pan or high rimmed cookie sheet works well). Pour 1 cup apple cider, 1 cup water, and ¼ cup lemon juice over meat. Turn the ribs to coat. Cover and let marinade in the refrigerator for 2-6 hours. Drain the ribs and blot dry with paper towels. 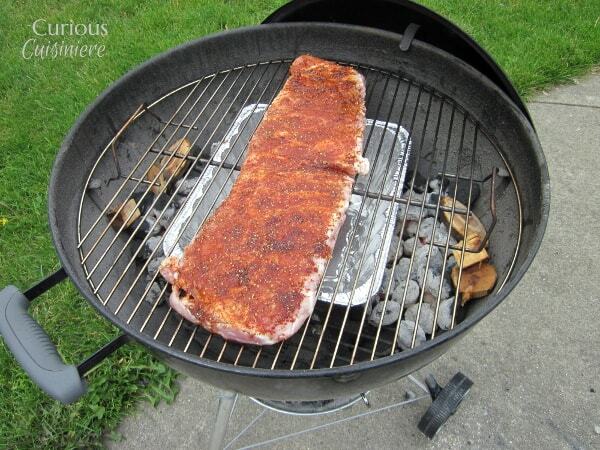 Sprinkle 1/3 c of rub over both sides of the ribs. Use your hands to press the rub into the meat. Let stand, covered 1-2 hours. Place the wood chips in a bowl and cover with 1/3 c apple cider and 2/3 c water. Let soak for 1 hour. Drain before using. When you are ready to cook, arrange 1 ½ c soaked and drained wood chips on the coals. 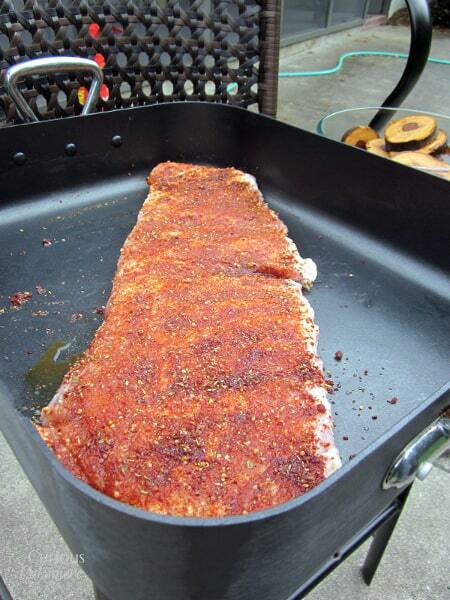 Place your meat on the center of the hot cooking grate, over your drip pan. Cover the grill and smoke for 3-4 hours. Every half hour to hour, check your grill. Add 4-5 coals and ½ c soaked and drained wood chips to each side. Using a clean spray bottle, spray your meat with apple cider (using about a cup throughout). Check the temperature of your grill and adjust the vents to keep it at medium-low heat. The ribs are done when the meat has shrunk back from the tips of the bone. 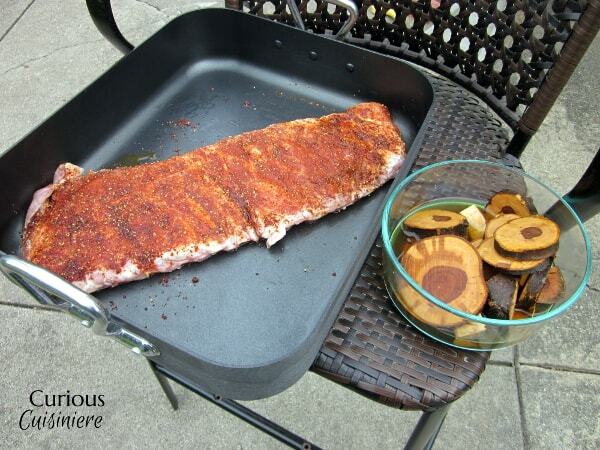 Transfer the ribs to a large platter and let stand for a few minutes before serving. 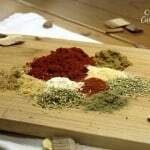 Impress your guests with fantastic smoked ribs seasoned with this homemade Rib Rub. Mix all ingredients together in a small bowl. Use immediately or cover and store in the pantry for 2-3 months. Don’t quite understand soaking the wood chips. Seems to me there is no smoke untill liquid evaporates off, before that you get steam. Now I wrap my chips in heavy duty foil, poke a small hole in foil and place on coals. Small hole means about round toothpick size. I get a slow steady stream of smoke and no waiting for liquid to steam off. Never noticed any dfferance in flavor between water and juice when I did soak, quit when I realized I was just steaming in the beginning. Usually use chunks, they last longer. Good point! We’ll have to look into this more and update the post with what we find. Thanks for sharing what works best for you! Awesome tips. I’ve smoked meats multiple times on my grill. I’d say that, if done properly, the results are as good as using a smoker. thanks for your help!